FoxyTunes is an Extension for Mozilla Firefox 2 that supports the Mozilla Suite ,Mozilla Thunderbird and IE7 . It allows you to control your favorite media player without leaving the browser. The IE version supports 18 different music players at this time, as opposed to the 21 supported in the Firefox version. FoxyTunes for Mozilla Firefox & IE, have the same interface , giving you full control over your music player from within your browser. Play, Skip Forward, Skip Backward, Hide Player and all the other music navigations in the original FoxyTunes. So now you don't have switch away from Firefox /IE to control your media player. This gives you hands on control right from your browser. Music Web searches - find lyrics, artist images, videos, bios and more, while listening to music with FoxyTunes. FoxyTunes Planet is a Universal Music Mashup. 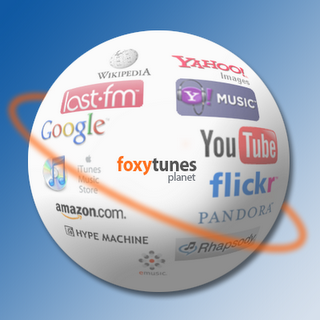 The Planet, along with the FoxyTunes browser add-on connects between your favorite media players and great music sites and services.